Colored Version of Classic Spike Card to be GalactiCon 2018 Giveaway! Long-time Champions of the Galaxy fans will remember one of the early advertisements for the game that appeared in the pages of Pro Wrestling Illustrated. 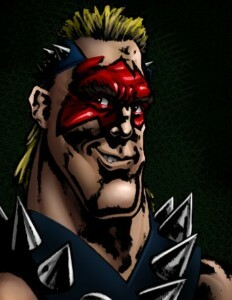 The ad featured the face-painted, headbanging villain Spike, with the quote “Hey Mom, the Babysitter’s Here!” The ad and the artwork got the attention of many soon-to-be COTG promoters. Now 30 years later that artwork is updated and immortalized as part of a special edition color card! The card will be an exclusive giveaway to attendees at GalactiCon in Pittsburgh on July 14th and 15th. Can’t make it to the big weekend? You can still get a copy of the card if you are a COTG Prime 2018 subscriber before July 15th, and the card will come with the rest of the summer cards. If you haven’t made your plans yet, check out all the details at the GalactiCon page HERE. For those unable to travel, stay turned for more information on how you can still participate in all the fun wherever you are in the world! ← Spring Promoter Prime Cards Coming Soon!